Before Old World Murder was published, several people asked if writing about real places made me nervous. I have a simple rule: I only write about real places that I love. Old World Wisconsin obviously fits that description—if I didn’t love the place, I wouldn’t have set a book there. Another real place that gets mentioned in the book? The Nite Cap Inn, in Palmyra, WI. The inn is a great cream city brick structure. I wondered if a new experience would overwhelm my memories. Still, we couldn’t ignore the invitation. Happily, stepping inside only brought my memories into sharper focus. 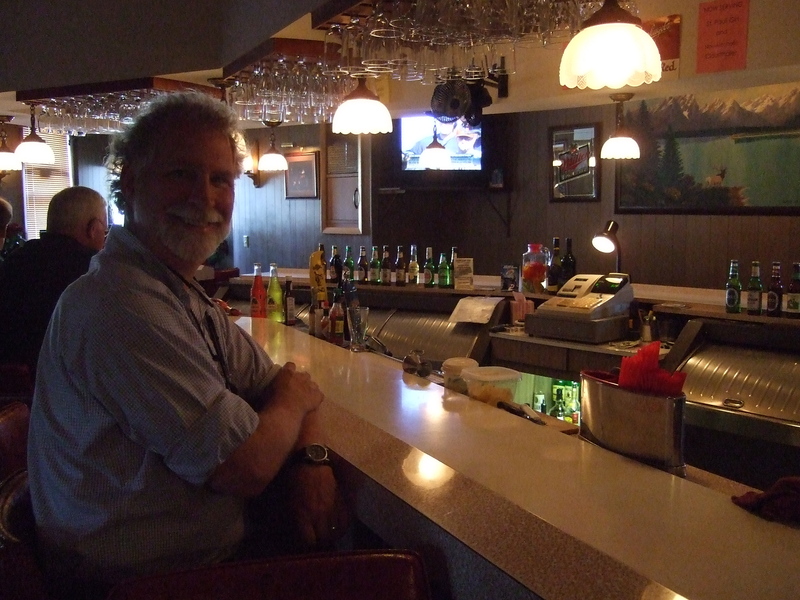 Fish fry patrons place their order, then relax at the bar while a table is prepared. A century or more ago, many guests traveled to Palmyra by train. Some were day visitors; others lodged in one of the rooms upstairs. 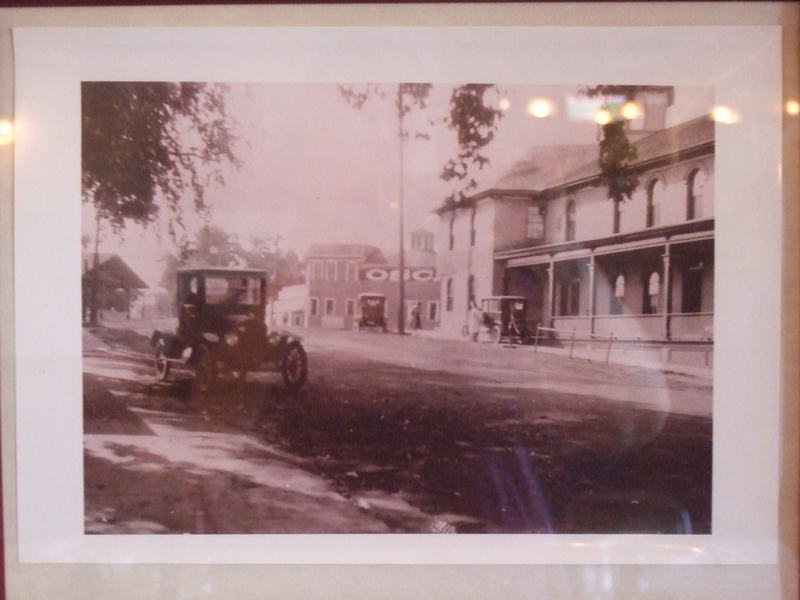 The inn has been a Palmyra institution for many years. When I moved to Wisconsin, I quickly learned the cultural importance of fish fries. “We attach meaning to our ritual beer batters and potato pancakes,” wrote Ann Christenson in Milwaukee Magazine. 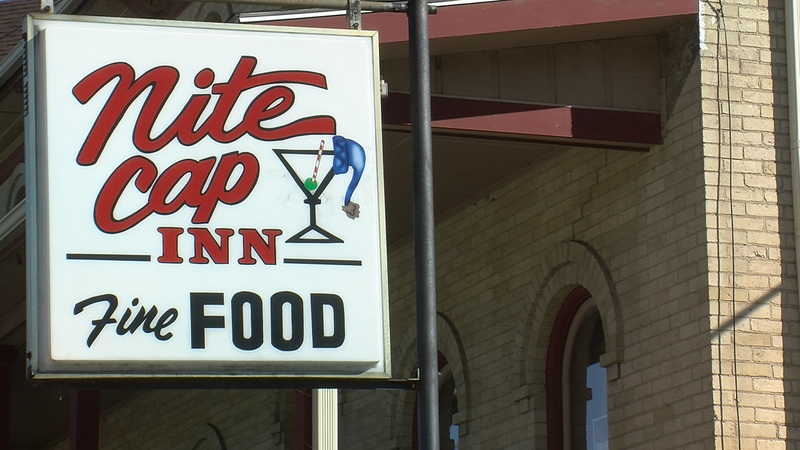 She went on to name the Nite Cap’s fish fry as a favorite: “Palmyra’s Nite Cap Inn is nothing fancy, but a place doesn’t have to be if the food is good. When I lived in the area, friends often invited me to join them at the Nite Cap. In addition to fish, the potato pancakes were famous. (I used those memories to describe the scene in Old World Murder when Roelke and Chloe meet Libby for a fish fry.) Occasionally an interpreter rented one of the Nite Cap’s rooms for the season, too. 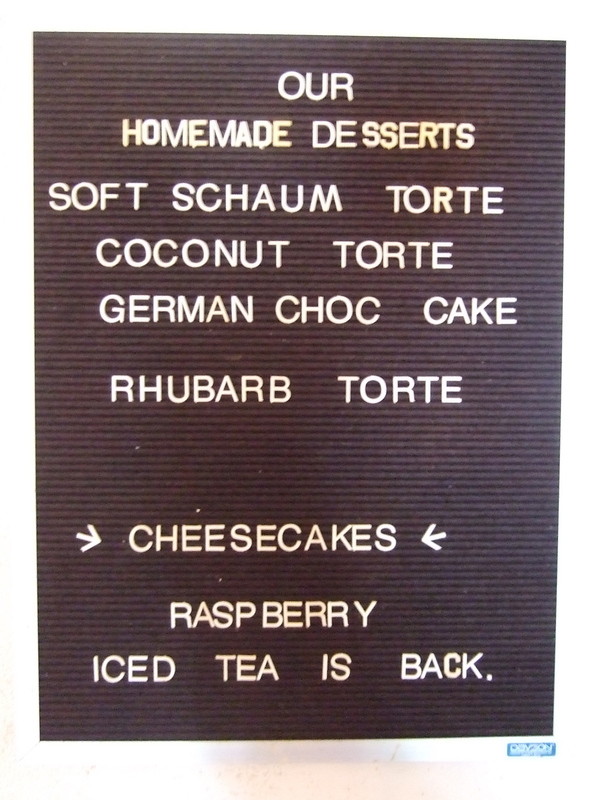 Back in the '80s, I always ordered schaum torte. It's still on the menu! 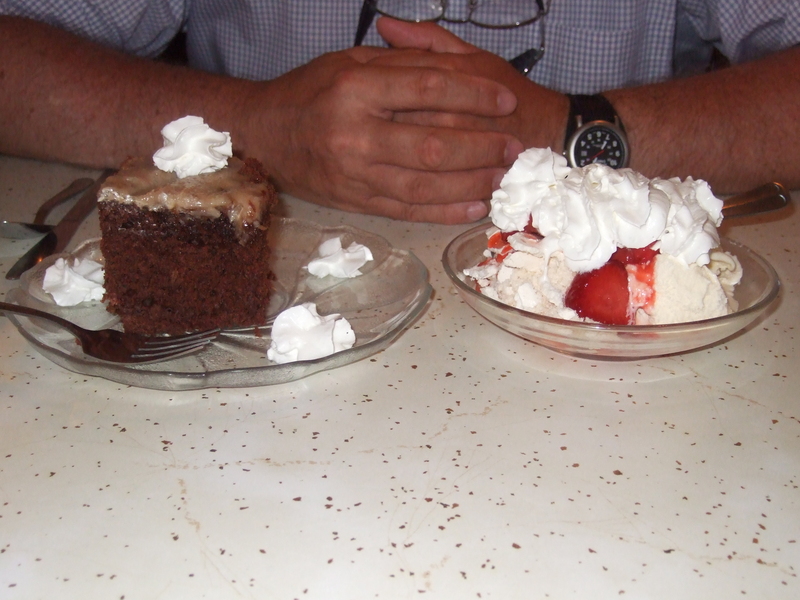 Scott opted for the German chocolate cake. The evening that Scott and I dined there, the couple at the next table was from Milwaukee. They’d been driving to the Nite Cap on Friday nights for decades. While we enjoyed our meal, Helmut settled at the piano. One piece flowed effortlessly into the next. It was delightful. It’s not often we can revisit favorite spot from the way-back days in any place but our memories. Do you have a favorite long-established eatery? If you haven’t been there in a while, it might be time to go back. This entry was posted on February 21, 2011 at 5:36 pm and is filed under BUSINESSES, FOODWAYS, Old World Murder. You can follow any responses to this entry through the RSS 2.0 feed. You can leave a response, or trackback from your own site. What sweet memories, pun intended! Old haunts are the best, especially when shared with good or special friends. Yum! I don’t really have a favorite restaurant, but I do vote for the Snow Lodge’s restaurant at Old Faithful in Yellowstone as having some seriously delicious food. Can’t get back there this year, though. Maybe next year? What a good description of the Nite Cap. Although I live nearby I haven’t been there in a long time. You have to go early in order not to have to wait a long time. I think they may be getting near to retiring. Yes, I think the building is for sale. Another reason to enjoy it while we can! My Daughter Krista & Grandaughter Ashley both work at “The Nite Cap”. Susie is still running it, Helmut’s health is failing! They still are rated with a very good fish fry, and yes you need to get there early. At least the lenten rush is over! They also still have homemade desserts, yummy! Kathleen does Susie know about the book? ?Love your books, look forward to seeing you again! Oh my! I’m sorry to hear Helmut isn’t doing well, but glad the place is still open. I’ll have to make a point to get out there. It’s like a snapshot in time, at least for me. So many things have changed over the years (decades! ), but eating there seems just the same. I did give Susie a copy of the book after it came out, but she had no reason to know who I was. Thank you every one. My husband is very Ill, But I am still here working every day. Please stop in any time to say Hello. Sue Nite Cap. I’m so sorry to hear that your husband is not doing well. I have such good memories of dining at the Nite Cap, and whenever I do a program someone always mentions how much they love your place. Sending good wishes. My mother and I used to drive out to the Nite Cap Inn from Milwaukee on occasion from the mid-1980s through the mid-1990s, whenever she had a yen to “go for a ride in the country”. The Nite Cap was always our end destination. Helmut would often play the piano and I always requested “The Third Man Theme”, which he played with gusto. The food, music and atmosphere were wonderful. Tom, thanks for sharing your memories. Maybe we were there at the same time one night! I’m not familiar with “The Third Man Theme,” but I can well imagine that Helmut played with gusto. Special times.